In his previous career as a naval officer, Nitish Pandey learnt to handle tension, adapt fast to new situations, and take quick decisions. He always had a sense of adventure. These four attributes, he finds, make him ideally suited for his current job as chief architect of information systems at online group buying firm Snapdeal.com. "I have to work on multiple systems at the same time," he says. "That's what makes the job exciting. I have to be really fast. I'm always on my toes." E-commerce is a hot, rapidly expanding sector, throwing up thousands of new job opportunities every year. It is expected to grow 47 per cent in India this calendar year to touch Rs 46,520 crore, says an estimate by the Internet and Mobile Association of India. 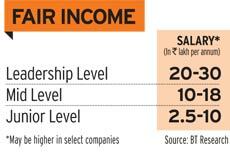 The salaries, too, (see Fair Income) are nothing to sniff at: at least one firm pays its senior-level staff around Rs 80 lakh a year. But be warned: you need the right temperament to flourish here. "Working in this field is a challenge," says Hitesh Dhingra, co-founder of the portal LetsBuy.com, which sells digital, electronics and lifestyle products online. "Business is 24x7. The pace is very quick. It is not something everyone can handle." Not surprisingly, most e-commerce companies maintain they are very selective in making recruitments. Snapdeal, for instance, employs one out of 29 people it interviews on an average. "We need to be careful to choose people who have the ability to adapt to something completely new," says Kunal Bhal, CEO, Snapdeal. The flip side of working in an uncharted field is that it offers plenty of scope for creativity. There are also no standard processes; every company must evolve its own. "That is a new challenge," says Dhingra. "People working in such companies need to be prepared for it." Thus it is not a matter of individual capacity alone. The quality of the team you join - or lead - is also vital. "It is tricky to get into a set-up where the team is not strong," says Prateek Srivastava, Manager, Technology Practice, Elixir Consulting, a recruitment process outsourcing firm.Ecommerce companies sometimes tempt prospective employees by offering them stock options, but these will be worth little if the team fails to deliver and the company's performance suffers. Where do entrants into e-commerce companies usually come from? They are largely nimble-footed, quick thinking converts from the fast moving consumer goods and telecom sectors, says Srivastava. "They are usually people with top business school backgrounds possessing exceptional selling skills or product engineering talents," he adds. "All those who like working in high-energy situations and want to do something different will suit this business."